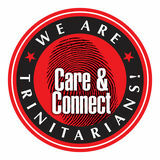 ife at TCA College begins with our dear faculty and staff. You have been more than just teachers and lecturers to us. You became our friends, mentors and spiritual parents. Your efforts in helping us grow beyond the grades will always be remembered fondly as we launch into our various mission fields. 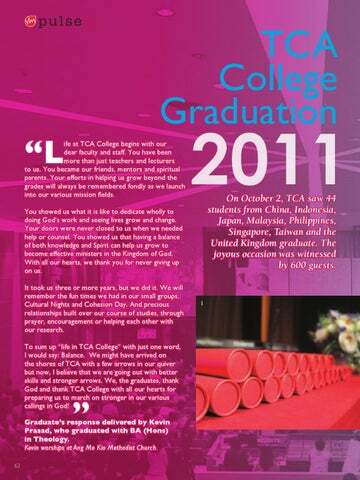 2011 On October 2, TCA saw 44 students from China, Indonesia, Japan, Malaysia, Philippines, Singapore, Taiwan and the United Kingdom graduate. The joyous occasion was witnessed by 600 guests. You showed us what it is like to dedicate wholly to doing God’s work and seeing lives grow and change. Your doors were never closed to us when we needed help or counsel. You showed us that having a balance of both knowledge and Spirit can help us grow to become effective ministers in the Kingdom of God. With all our hearts, we thank you for never giving up on us. It took us three or more years, but we did it. We will remember the fun times we had in our small groups, Cultural Nights and Cohesion Day. And precious relationships built over our course of studies, through prayer, encouragement or helping each other with our research.